Artful jounaling is about writing as you would in a diary, while also artfully decorating the pages of your journal, either before or after writing, with all sorts of media and … well … stuff. In this series, I’m going to use the alphabet to take you through how I artfully journal, what I’ve learned about it, who I’ve learned it from, and how it’s helped me find wellness and develop mental and emotional resilience. 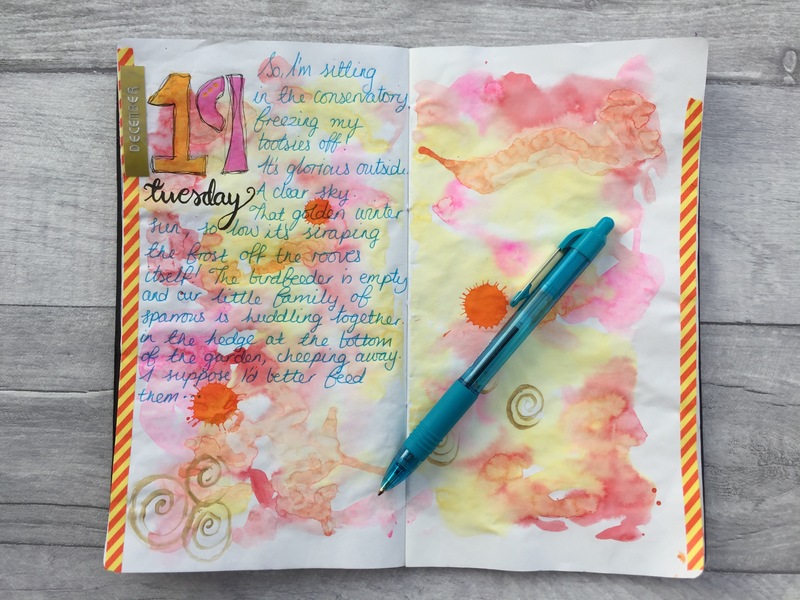 My hope is that you will, if you haven’t already, catch the artful journaling bug, and if you have already caught it, I hope that you find some of my ‘how to’ posts helpful and that you’ll share some of your wisdom in the comments. 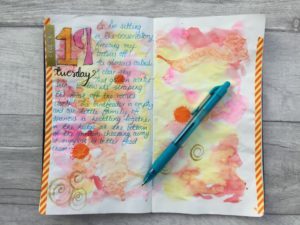 All you really need for artful journaling is a notebook and something to write with because you can decorate the pages simply by doodling on them. However, a big part of the enjoyment for me is splashing colour on the page – I love bright colours; they lift my spirits and give me a feeling of hope and joy – so I would recommend investing in a decent set of watercolour paints and a good brush. Buy the best paints you can afford, and buy the best brushes you can afford because with art materials you really do get what you pay for. Their reasoning is that if you use cheap paints and brushes you won’t be able to achieve the effects you’re after, and you’ll become disheartened and give up before you’ve really started. My experience definitely tallies with this. 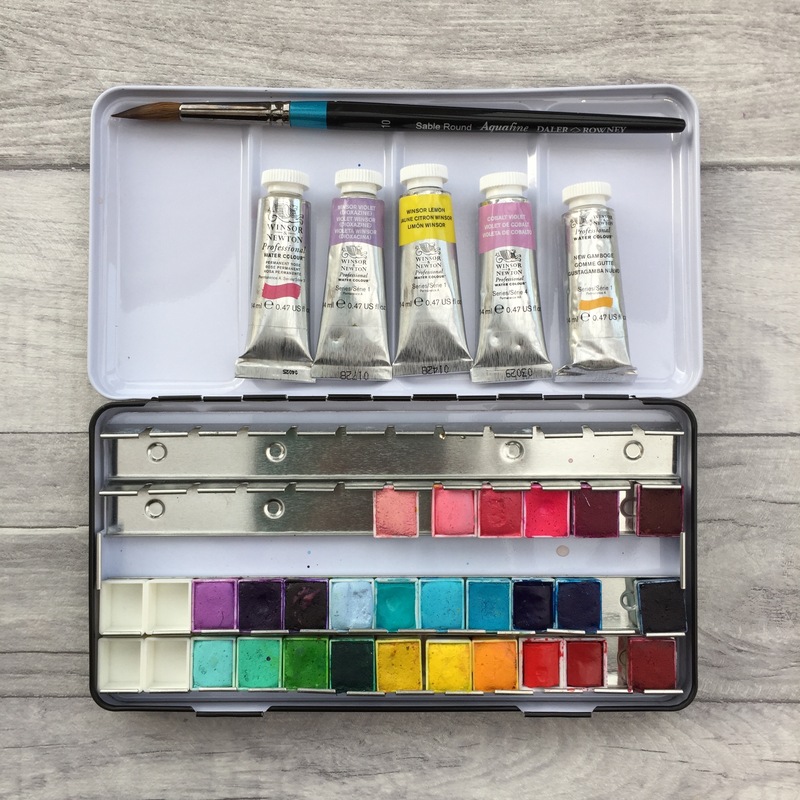 I started out with cheap watercolours, and they just didn’t flow and blend on the page as I’d hoped they would, so I upgraded to Winsor and Newton Cotman paints (their student-grade brand) and these were much better and not too expensive. I’m now in the process of upgrading again to their professional range, which is a lot more expensive, but boy, are these paints stunning – they explode onto the page like fireworks! 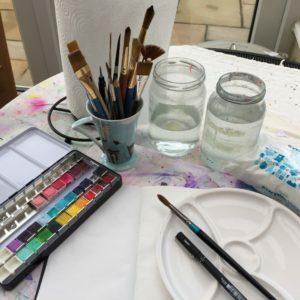 I also have a set of Jane Davenport watercolours and a set of Prima Marketing watercolours. These too are good for artful journaling and are not particularly expensive. Another disadvantage of cheap watercolour paints is that they often contain a lot of filler, which gives them a chalky feel on the page once dry. I don’t like this feel when I’m writing, but this might not bother you. It’s something to take into consideration though. With brushes, my experience differs a little from my tutors’ advice. I use a range of brushes from ‘cheap as chips’ to ‘mediumly expensive’ because I’ve found that different brushes are good for different techniques, but I’ll come onto that later in the series. Unlike with paints, I think it is a good idea to start with inexpensive brushes and work your way up until you find what suits you. Paper is the other thing to think about – more detail on this later too – but, briefly, if you want to use wet media like watercolour paint, you’re going to want a paper that doesn’t fall apart when wet and that doesn’t soak up the wetness too fast or let it bleed through to the other side. 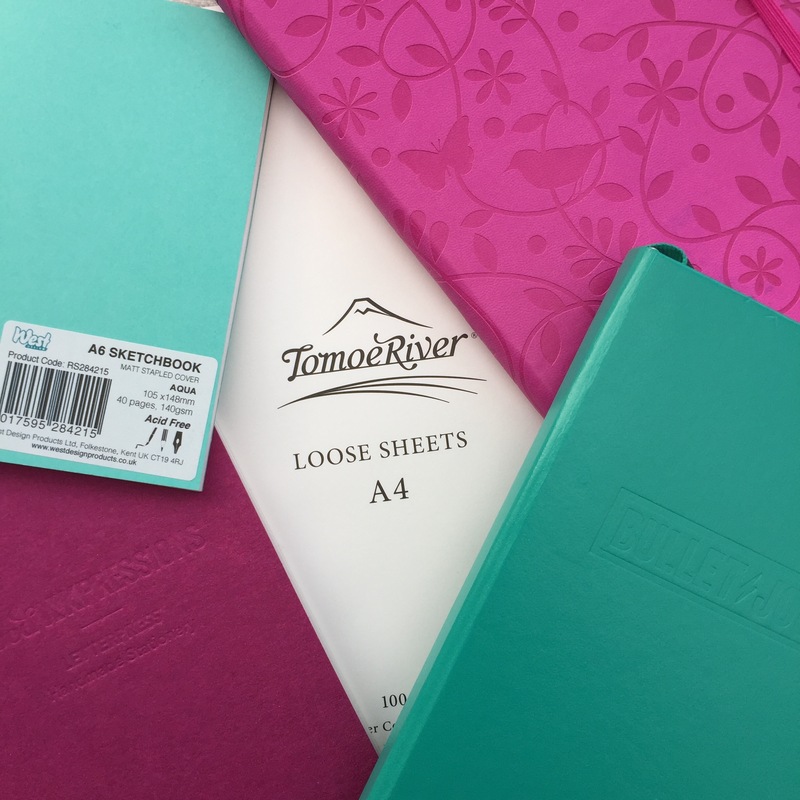 A favourite amongst artful journalers and fountain pen enthusiasts is Tomoe River Paper. It’s thin, doesn’t fall apart when wet, takes watercolour beautifully and has a very satisfying crinkle once dry, but … and this is a BIG BUT … it’s expensive. My advice would be, as with paints, buy the best paper that you can afford – maybe test out a few brands by picking up notebooks in the sales or buy paper loose, and make some journals yourself. There are other things you’ll find useful to have on hand: a ceramic mixing palette (an old white plate will do fine), two water pots (one for cleaning your dirty brush, and one for picking up clean water with your clean brush), paper towel or old rags, baby wipes and a heat gun or hairdryer. There are lots of other things you can use to add colour, texture and interest to your pages, but we’ll come to those as we work through the alphabet. Of course, you’ll need something to do your journaling with. This can be any writing implement: a pencil, a ball-point pen, a fineliner, a gel pen, a fountain pen – whatever takes your fancy. So, there you have it … that’s the basic kit … If you’d like to be notified when I post the next part of this series, you can subscribe via the menu up the top on the right hand side. Now, it’s your turn. Are you an artful journaler? What media do you use to decorate your pages? See you on my next post: The A – Z of Artful Journaling: Background Basics. This entry was posted in journaling, mixed media for memory keepers. Bookmark the permalink.